Yesterday, I won a race. Over the past few years, this has been happening fairly regularly and quite honestly, it’s a bit weird. I sort of feel outside of myself on days like this: people are congratulating me, saying cool things about me being an inspiration and a speedy runner, but it just doesn’t feel like they’re talking about me. So while this is going to be a race report, it’s also a bit of an offload about why this stuff means so much to me. People who have known me for more than about 10 years will know that I’m not sporty. My friends used to call me ‘Dictionary’ and there was nothing I liked better than sitting in my room, reading. Sport at school was my idea of hell. I was a bit dumpy, had no coordination and just didn’t enjoy any kind of physical activity. I mean, you got all sweaty! In year 11, I joined the netball and hockey team under duress because they needed an extra body and no-one else would do it. Still don’t know the rules. It was only when I decided that I needed to join a gym when I was in my late teens – purely for vanity – did I even consider running. My first 5k was a Race For Life when I was about 19 which took me about 30 minutes, and for a long time, I just did some 10ks and ran on a treadmill. 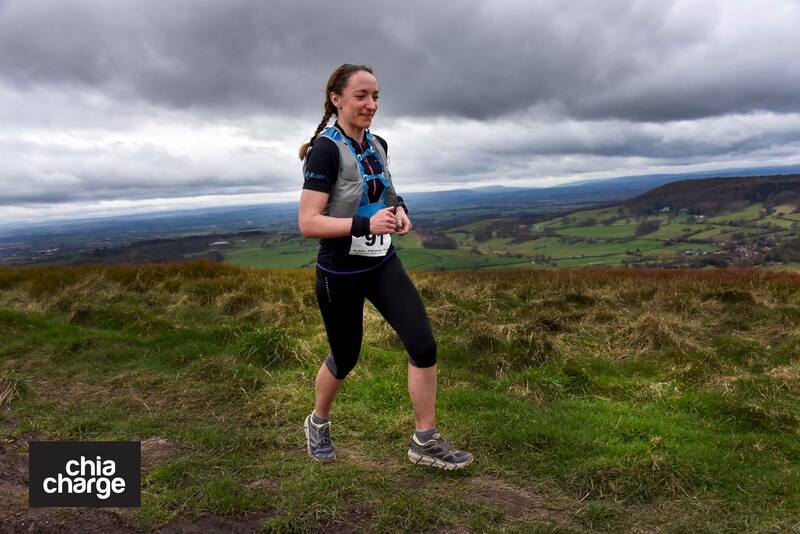 Joining Pickering Running Club when I was around 28 was a scary thing: people in running clubs are all really fast aren’t they? But this lovely group of people showed me some beautiful areas that I didn’t know existed, drove me to fell races and one day, a man called Mike Hetherton suggested I enter the Yorkshire Three Peaks Race. That was it: that first long, off road event in 2012 chewed me up and made me cry but I finished it and I wanted more. The next few years were amazing for my running. If you’ve seen me run, you’ll know it’s not pretty. I was once told, ‘I don’t know how you get the results you do with the way you run!’ Not pleasant to hear, but sort of true! I’ve suffered with my ITB badly and for a long time was convinced that it would hold me back forever. But meeting Jayson – someone who loves to compete – changed my view of myself too. I saw how much he pushed himself in races and I wanted to see what I was capable of. Could hard work actually make me better, in spite of my issues? It’s been a long road, with a really difficult running year last year, but yesterday proved to me again, that yes, it can. In the lead up to the Hardmoors 55, I had been training hard. Jayson wrote me a new plan every month or so from the start of the year, incorporating varied strength, hill and speed work, and it was fairly intense. It had to be: I wanted to try and break 9 hours after doing 9.04 two years ago and dropping out last year.I knew from Katie’s winning time last year that this would be tough. She had a tremendous year and it seemed that the course was harder from Helmsley to Guisborough. Still, I turned up on the day feeling relaxed and confident that I would give it my best and what would be would be. Hanging around at the start, I chatted to lots of folks, all with their own aims and worries. We even had some sharing about ladies’ problems and the logistics of dealing with them on ultras in the queue for the toilet, which was interesting! So many things to think about! Before I knew it though, we were off. Last year, I felt like I went off too quickly with Shelli and Adam, so I decided to keep it easy. Even then, I felt like I was charging along and when I found myself next to Dave Troman, I knew I was maybe going a bit fast! Dave commented that everyone had gone off at a silly pace and we’d see them all soon – wise words and very true! Coach had told me to run all the hills except the steep ones, so I resolved to jog up that little kick just before Cold Kirby. It was here that I passed Carol Morgan – fresh (sort of!) from destroying The Spine. She gave me a pat on the shoulder and wished me luck. This was a ‘recovery run’ for her! Closer to the top, I met Shelli too. I told her what I was trying to do and she agreed with me that this direction was tougher. Still running, I left Shelli through the fields and that was the last time I saw the ladies until the end. I was surprised to be ahead, especially early on, but was still comfortable, so went with it. Seeing some familiar faces is always what makes Hardmoors events so enjoyable and Jonathan Baker was loitering somewhere near the road crossing at Sutton Bank to give me some lip. His dog’s really cute though, so I can let him off. Dave Cook and Inner Dave gave me some encouragement across the road and then it was down to the White Horse. I couldn’t resist giving Kelly Brearley’s litte pup, Teddie, a fuss as I headed down the bank. Here I met an old PRC clubmate, Mike Todd, on his first ultra. He looked really comfortable from the back but told me he’d set off too fast and was blowing a bit. I tried to give him some tips and went straight through the checkpoint and up the steps to find my crew at the visitor centre car park. It was a fantastic noise down there: just before I got through, a lady out for a morning run was cheered through! She must have had a shock! Steve and Darren were at the promised point and loaded me up with more fluid, some carrot cake and a cookie and I set off on the swoopy trail to Sneck Yate. This section is a bit of a blur. I know I was going well, but I know I didn’t run up to High Paradise, which I had thought I was going to do. I was eating well though, have scarfed down my carrot cake and cookie before Sneck Yate. Tony Holland was running out to meet Shelli here and I had a face full of food so apologies Tony if you got cookie spray on you. I barrelled down into Square Corner in about 2.55hrs and I remember saying to Steve that I think that was about the second fastest 20 miles I’ve ever run. He told me I was doing really well without being gushy (he knows the dangers of being nice to me on an ultra = tears) and sent me on my way, all stocked up. Darren was taking the opportunity to do his long run from here and would meet up with us back at Lord Stones. Another fuzzy section I’m afraid! This happened to me on the HM 60 in 2015: I went into a sort of trance and just kept chugging away. I do remember seeing a bouncy, red-shorted, swingy pony-tailed lady running towards me just before Osmotherley: Heather! She stopped, screamed my name and said she could tell me from a mile off! I said the same thing to her and then did a – probably wildly insulting – Tigger impression. It was lovely to see her and gave me a little lift going into the village. Ann Brown snapped what seemed like an extreme close up just before the alleyway and then I was in the hall, grabbing some orange juice. Food was starting to look very unappealing which I remember being vaguely worried about. I marched on nonetheless, with a quick thankyou to Jane, Simon and the other checkpoint crew. 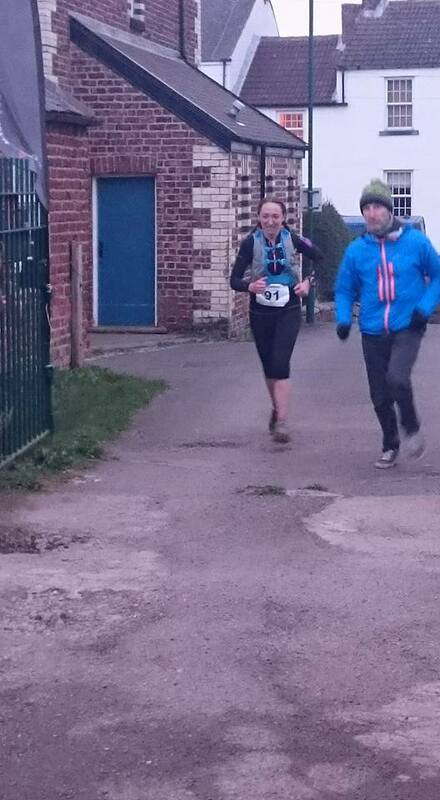 Caroline Graham, my support on the CCC last year, was another friendly face in the woods before Scugdale. She worked her magic again, offering me grapes that turned out to be just what I wanted, even though I didn’t know it. She carried on to find Ian and I kept going. Steve was waiting just before this checkpoint, just for some moral support, and we had a little chat about what I needed next as we came up the road. I left him, had a handful of Haribo hearts from Simon’s checkpoint and set off again. On this next stretch up Round Hill and Faceby Bank, I started toing and froing with a couple of chaps who were running together.One of them was utterly delighted to see Roseberry Topping in the distance and remarked that we’d practically finished if we could see that! I don’t know whether he was blissfully unaware that was not the case or he was trying to cheer himself up! My phone started ringing here but by the time I got to it, it had dialled off. It was Steve. I tried calling him back a few times but it didn’t connect. I could only think that he must be having a problem and wouldn’t be at Lord Stones. I had enough with me until Clay Bank so I wasn’t too worried. Coming down Carlton Bank, Steve was waiting at the gate with a few other people. He told me it was carnage in the car park as the overflow was locked so there was nowhere to go. He had had to park much further down and run a few supplies up to me. It was fine in the end and I motored on, eating some bread and cheese. I saw Darren standing by the toilets, phone in hand, obviously not knowing where Steve was, so I told him and kept going. Like most people, I have a bit of a complicated relationship with the Three Sisters. The views are spectacular, and they have a lot of good memories for me, but when you’re 30 miles into a race, they are nasty ladies. I find this direction the hardest too. The descents are more technical, which slows me right down. It did give me a chance to have a break though! I ate, drank and took it fairly easy. Seeing James Campbell on the Wainstones descent, I remember saying that I was probably the only person who got a break on these hills! Coming down into Clay Bank, I had another special dog moment. There was a little dachsund in front of me, belting down the steps and it was the cutest thing I’ve ever seen. I told his owner at the bottom and he said that his other one had run away after being chased and he was hoping he was back at the car. I hope he got the little chap back. Coming down the Wainstones, I had caught up with Paul Nelson, also coming back from The Spine. He trotted down the hill in front of me, telling me how hungry he was. We got to the steps and Darren was there with my requested bottles, fruit and sweets. I gave Paul one of my Chia Charge flapjacks and we set off together up to Urra Moor. He was obviously tired and finding the climbs hard, so I left him to get refuelled and made my way to the highest point on the moor. I had planned on asking for my iPod at Clay Bank, as I assumed I’d be moving at a snail’s pace and bored out of my mind over to Blowarth and down to Kildale, but I forgot. Actually, this turned out to be a good section for me, although doing the maths in my head, I was starting to reassess my goals as I wasn’t sure sub 9 hours was going to be realistic. This wasn’t bothering me though, I was just determined to keep trying for it. It was one of those rare days up there, where the wind seems kind and you can see for miles. Just before the turn down onto the tarmac to Kildale, I was surprised to see Caroline again, this time with Ian. It hadn’t been his day but they were still out supporting friends Jo and Rebecca. They offered me some grapes again, but my body was starting to get picky about a lot of things! Even though I’m not a confident technical descender, I can cane it on the road, which I did and got down to Kildale in around 7 hours. I was pushing it for time, so when the marshals asked to see my headtorch, I may have cursed a bit! I hope I didn’t seem rude, but when your kit’s all nicely wrapped up in dry bags, your fingers are a bit swollen and you need to get going, your brain does weird things! They kindly helped me get my torch out and even packed it back up while I necked some coke, so I am very grateful. The running up things plan had gone out of the window, so as I walked up out of the village, scoffing some jelly sweets, I saw Rich Buckle in front of me, ploughing up with his poles. I eventually caught him as we climbed through the woods towards the monument and we chatted. He said he had hoped not to need to get his torch out and I was adamant I wouldn’t be! I left him at the top where he gave me an encouraging ‘ Go Kim!’ and I seemed to get to Gribdale Terrace quickly. Steve and Darren were waiting for me, this being the last time I would see them before the end. They gave me some fresh bottles and Steve walked up the short climb with me, stuffing jelly sweets and kendal mint cake in my pockets as I swigged some flat orangeade. He left me to it and I made my way towards the penultimate hill.I love going down Little Roseberry and seeing people coming the other way. It’s so nice to know that we’ll all be done in a couple of hours! There were too many people here to name but one person I was delighted to see was Pete Boyes. Jayson had been coaching him too and he had not been sure he was going to be able to even start a few weeks ago, let alone get his target of sub 9 hours. He looked really happy and relaxed, and I’m pleased to say he beat me, so he got his goal! I had been anticipating reaching Party Hill all day and Lauren and Chris did not disappoint. Inflatable animals, bunting and bubbles were all brought to life by Lauren’s amazing congratulations. Thank you you two, you really gave me a lift and the fizzy sweets were ace too! I made my way steadily back down and checked my watch again. 8 hours and 5 minutes. Could I do it? This section is one of the only really clear things I remember, even just a day later. I was out of my robot zone and on a bit of a mission now. Deep down, I thought I might be able to beat Katie’s time from last year but not get sub 9 or even beat mine and Shelli’s time from 2015. Still, I dug in and ran as hard as I could without leaving myself too depleted for Highcliff and the railway line. I was continuously gaining on people, then getting by them and still feeling pretty strong. Everything hurt, yes, but it was manageable. Climbing Highcliff was a bit of shock – I normally go straight up, not round and up the steps! Glynis was so happy to see me and I don’t think I said much to her as I was so focused – sorry Glynis! This was it now: only a few miles and I could afford to trash myself. I managed a good pace here. My last few miles were down to 8 minute pace which is really pleasing as my ‘easy’ pace has definitely improved in the last couple of months, so this is where it started paying off. I even saw the Boss himself hanging glow sticks on a wall and managed a hug in motion! At the top of the concrete hill, I looked down and saw Jayson and Indie coming up to meet me. He told me I could still do it: he had just passed a few others who were definitely on for sub 9 so if I caned it, I could make it too. I knew I had started to work really hard here, as this is where the odd noises began. Looking at my watch data, my heart rate didn’t get that high, but my lungs must have just about given up (my ribs feel very sore today!) Passing the last checkpoint and turning onto the railway line, Jayson told me it was only about a mile. He stayed behind me and kept giving me encouragement as I panted and wheezed my way along. Steve and Darrem came into sight at the top of the steps and I had to slow to get down them – why are they so shallow?!? – and then started the last kick on the road. I did feel mildly embarrassed at the noises emanating from me and the face I knew I was pulling but I looked at my watch and it read 8.59.41. I knew sub 9 wasn’t on, but I’d be damned if I was going a minute over. With Steve and Darren sprinting along next to me, I fell into the hall and collapsed face down on the floor. I was really enjoying being there, but Wayne and Karen made me get up, probably for my own good! 9.00.38 the final time and I couldn’t have been more proud of myself. Deep in the pain cave, as they say. I wore my Hoka Challenger ATRs and they were perfect for the dry conditions. They’re comfy and light, and like a fat bike for your feet: they just roll over rocks. They do fit a little tight though, especially with Injinis so I got a couple of blisters on my oddly shaped toes. The Montane Via Snap 4 pack was awesome too. It’s the first time I’ve raced in it and will do again. It was very comfortable, fit everything in it with room to spare and has accessible pockets. The best thing about it is the elastic fastening at the front though. It means you can breath really deeply but it still stays snug. I used Precision Hydration 1000 and 1500 tablets. We met these guys in Chamonix last year and I was really impressed with their simple approach. Keeping fuel and hydration separate is something I really believe in, so their products work really well for me. I drank a 1500 the day before and one on the morning, then kept topped up with the 1000s all day. I ate ‘real’ food, such as bread and cheese, Chia Charge flapjack, oranges, melon, homemade cake and cookies and moved onto jelly sweets and kendal mint cake towards the end. No gels! In hindsight, I could maybe have had more fluid but it didn’t do me any harm ultimately. What has this race taught me? I said at the start of this – sorry, very long – blog that I was never the sporty one. I still think this about myself. I know that is utterly ridiculous but there’s always that little voice telling me it was a fluke. I was talking to someone on one of our training camps recently about how who we are as children shapes how we see ourselves as adults and I know this affects a lot of people. Just because I was a ‘brain’ at school and because I hated exercise, that has no bearing on what I can achieve now. I may not have been running since I was 10 and I may have only been doing ultras for a few years. I may have a wonky gait and look a bit ploddy when I run. I may still have that kid inside me that just wants to sit inside with her nose in a book. I may see myself in this way, but other people see me as someone else. It’s amazing to me that with some very hard work, being around supportive and positive people and telling yourself you can do something incredible instead of finding reasons not to try, can completely change the way you see yourself. It might sound cheesey but positive self talk got me a great result yesterday. In the words of a very wise man, ‘It’s time to stop doubting and start believing’.